Tabitha is the miniature of the team, though you would never think it with the size of the fences she jumps. As the daughter of Mark and Tanya she was pretty much born in the saddle and is already a very talented young jockey, having competed at Olympia for the first time at the end of 2016 in the Mistletoe Stakes! She is a brave and competent rider, and it will be exciting to see how she and her ponies improve together. In 2017 Tabitha had a great season notching up 75 BS wins in the UK & 23 Wins in Ireland. Her biggest win to date was at Liverpool International on Lissduff Royal in the 138 Grand Prix on New Years eve. 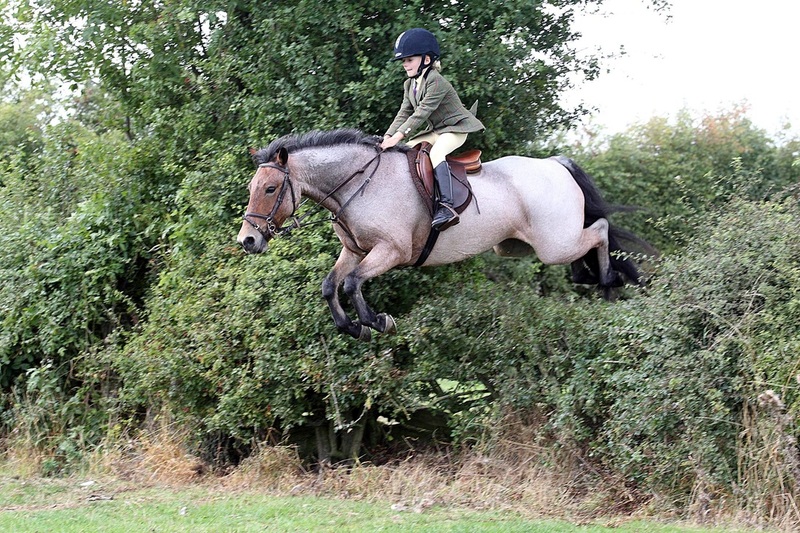 William may be little but he has a big heart and a massive jump! He is a like a proper horse- just condensed into a smaller model! He is a very talented member of Tabitha’s string and we very much look forward to seeing what they can achieve together. Bliss has improved a huge amount since she came to us. Royal came to us at the end of 2016. He is a real character. Tabitha & him get on great together. When they are on form there is not many can match them. Vienna joined the team at the Cavan Chrismas show. She won the 1 m both days & the 1.10 m championship on the last day. Looking forward to seeing how Tabitha & Vienna progress in 2018. Tabitha is a regular on the hunting field, with a reputation for her gutsy attitude to hedge hopping alongside the adults. Together with the amazing hunting pony Tezzi, kindly loaned to Tabitha by the Brewitt Family, they make a great pair out hunting with the Quorn and the Readyfield Bloodhounds. After buying Poppy from Ireland , we weren’t to know that this slightly tubby pony was actually carrying an extra passenger! And so as the eventing season came into the swing we eagerly awaited the arrival of baby Daffy- who was born just after Belton International Horse Trials. Poppy is an eye-catching colour, but also turns heads for her springy jump- hopefully she will pass her talents on to baby Daffy for when he gets older! ​Bugsy who was bought as a 4 yr old from Holland off a video. He has gone from strength to strength. We bought Candy as a 4 yr old from ireland. She has a super temperament & jump. Tabitha has ridden her from day one. Bjorn is also a new member to the team also arriving just before Cavan Christmas Show. ​Herbie was found in Ireland by tabitha's grandad last summer. He has only done a few shows but has shown great potential. Poppy's cheeky yet adorable foal. He is currently spending some time in the field learning from all the big horses!